MOSCOW, April 13. /TASS/. Russia’s President Vladimir Putin earned 18.728 mln rubles ($302,201) in 2017, up 9.8 mln rubles ($158,013) compared with 2016, according to the tax return posted on the Kremlin's official website. Last year, the President’s average monthly income was 1.5 mln rubles ($24,183) against 738,000 rubles ($11,898) a year earlier. The president does not own a land plot of 1,500 square meters anymore. The other real property, an apartment with the area of 77 square meters and a garage of 18 square meters, remains unchanged. Putin also uses an apartment with the area of 153.7 square-meters and a parking lot of 18 square meters. All property declared by Putin is in Russia. In 2013, the Russian president earned more than 3.6 mln rubles (about $100,000 at the time), in 2014 - 7.6 mln rubles ($122,700), in 2015 - around 8.9 mln rubles ($143,700), and in 2016 - 8.85 mln rubles ($143,000). Russia’s Prime Minister Dmitry Medvedev earned 8.565 mln rubles ($138,114) in 2017, according to the tax return posted on the official website of the government. This is nearly 21,000 rubles ($338.6) smaller than in 2016, when Medvedev’s earnings totaled 8.586 mln rubles ($138,444). 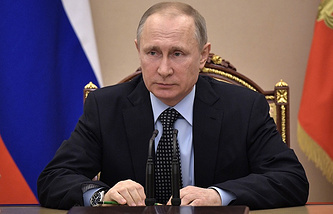 "Further to the base pay (salary), information about earnings presented in the table [of earnings, expenses and property posted on the website - TASS] always include the amount of interest on bank deposits," the government’s office told TASS. "A certain reduction in the total amount of annual earnings in 2017 versus 2016 is related to reduction of earnings from interest on bank deposits," the office said. The return does not contain any other changes in respect of movable or immovable property. Medvedev owns an apartment in Russia with the area of 367.8 square meters. A similar apartment is registered for use by his spouse Svetlana. Furthermore, the Prime Minister holds a land plot with the area of 47 ares in Russia on lease conditions (for the term of 49 years). As before, the Prime Minister owns two vintage cars - Soviet GAZ-20 Pobeda produced in 1948 and GAZ-21 Volga manufactured in 1962. Deputy Prime Minister Alexander Khloponin is the biggest earner in the Russian government with an income of 2.9 billion rubles ($47 million) for 2017, according to the tax returns posted on the government’s website on Friday. According to Khloponin’s tax returns for 2016, his income was considerably lower at 9.9 million rubles ($161,000 at the current exchange rate). Therefore, the vice-premier’s earnings have soared 293 times, which is 340 times more than the earnings of Russian Prime Minister Dmitry Medvedev who declared an income of 8.5 million rubles ($138,000) in his tax return for 2017. Calculations suggest that Khloponin daily earned 7.9 million rubles ($128,599) last year. A year ago, Head of the Ministry for the North Caucasus Lev Kuznetsov was the biggest earner in the Russian government with the earnings of 582.1 million rubles ($9.5 million) indicated in his tax return. This time, he dropped out of the rating of the government’s top three earners. Khloponin is followed by Agriculture Minister Alexander Tkachyov who indicated an income of 548.2 million rubles ($8.9 million) for 2017. Placed third is Vice-Premier Yuri Trutnev with an income of 377.2 million rubles ($6 million). Khloponin’s office explained such a big difference in his incomes by the sale of some properties. "If you compare the tax returns for 2017 and 2016, you will see that there have been changes in the list of properties," Khloponin’s spokeswoman Natalia Platonova told TASS. The lowest earners in the Russian government last year are Natural Resources Minister Sergei Donskoi (5.2 million rubles or $85,000), Communications Minister Nikolai Nikiforov (5.8 million rubles or $94,400) and Labor and Social Development Minister Maxim Topilin (5.9 million rubles or $96,000).